I have read and heard that hermit crabs are social creatures who thrive with other crabs. I adopted 2 crabs at the end of the summer and one crab died as a result of molting complications. Bluey has been a singleton for over a month now. There is a chance now to take in a crab whose owner no long wants which would add a friend for Bluey (I have a 20 gallon tank so 2 is my max). However, I have mixed feelings about doing that. After spending a lot of time buried at first (and molting once) she has now gotten into a routine of spending much more time up on the surface and she has her favorite spots and all the food to herself. How do I know she doesn't enjoy it that way and bringing in another crab would upset her - competition for shells, food, good spots, etc? I am probably projecting myself as I am an introvert and prefer solitude. Thoughts? Re: Keep crab as a singleton or add a friend? I personally would get the other. Mine sometimes enjoy eachother - or at least, will follow eachother or hide together - and your singleton may appreciate it. I think you have valid concerns! I often wonder the same about my exotic loner, if I am doing the right thing or if adding another will screw up how well she is doing. However, pairs work really well with Purple Pinchers. 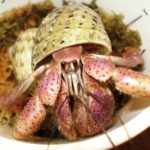 The longest living crabs in captivity were a pair of males who lived nearly 40 years together, one passed a few years ago and the other is still going strong! We see both singletons and pairs up for adoption who have been alive more than a decade, so there is anecdotal evidence it's a good situation for them either way.